45 Super is externally/dimensionally identical to 45 ACP or 45 ACP +P and is designed to be used in 45 ACP semi-auto pistols that have been fitted with stronger than normal recoil springs and a shock buffer, plus a couple other modifications. While you can shoot 45 SUPER out of some stock 45 acp+P pistols such as the Glock 21, HK USP or the full sized all steel 1911, you will batter your pistol if you do not have them modified to handle the extra pressure and slide velocity of the 45 Super. To learn about the modifications your 45 ACP pistol needs to reliably and safely fire 45 SUPER, contact Garey Hindman at 936-402-3484. Garey is the foremost authority on 45 Super modifications/conversions for your 45 ACP and Garey performs such conversions for a living. 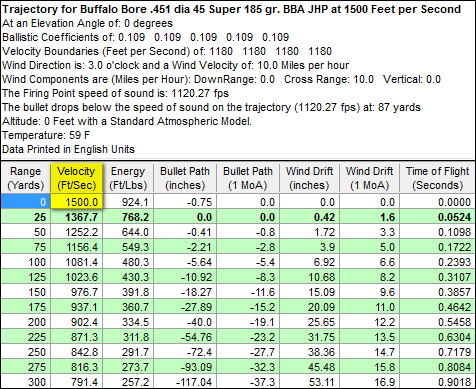 The below velocities were fired from my Colt Gold Cup Govt. Model (5-inch) that was converted by Garey. 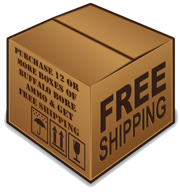 As always with Buffalo Bore Ammunition, we use real world firearms to give you real-world data and results. All our 45 Super ammunition is loaded with flash suppressed powders so that if you have to fire in low light (when the criminal element is out) you will not be blinded by your own gunfire at the worst possible moment. All three of the JHP loads were designed for anti-personnel use and for hunting small big game like deer. 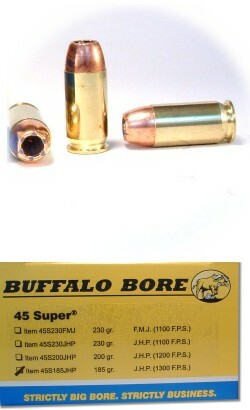 The two solid bullet loads were designed for breaking large bones like a bears shoulders or skull but will work for anti-personnel use as well if you need to shoot through cover like car doors or stick frame walls. I tried this stuff out last night in my Glock 30 WOW!! Awesome!! Accurate! I loved it!! No mods were made to the gun. Recoil for me was a bit higher than Remington 230 grain JHP's but very controllable. I had no problem whatsoever making quick follow up shots at 20 yards. Please note that I'm 6'5", 250 lbs, with plenty of upper body strength and that I do a LOT of shooting with Glock 20's loaded with the 185 grain buffalo bore jhp's which kick a bit more than this stuff does. My wife was in the adjacent booth shooting and she had to stop from the concussion she felt throughout her body was shoving her back. She said it felt like someone was shooting a shot gun next to her.LOL I'll definitely be purchasing more! We were both smiling from ear to ear! I liked the thought of more bang, either for hunting or carry. But when I shoot this ammo there is LOTS of recoil. When I was shooting a lot I might of been able to handle it better, which it doesn't bug me now, but a second shot in a HK45C is "super" hard. For the price I may stay with Gold Sabers or some p ammo. With my Mark23 the recoil isn't bad so I wouldn't mind it in larger frames and barrels. I have 45 rounds left and will buy more when I need that extra stopping power! 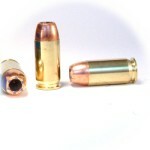 I have shot all three .45 Super loads through my Para- Ordnance, from 185 grain to 230 grain. As a stock pistol it was heavy on recoil but not unexpected, and none were uncontrollable. All three loads were very accurate, posting 1.2, 1.5, and 1.33 inches at 25 yards from a rest. With compensator, they are great to shoot, with no more kick than a 200 gr semi wadcutter, though loud.